Mooi nieuw boek over het vissen met kunstaas. 1e druk. 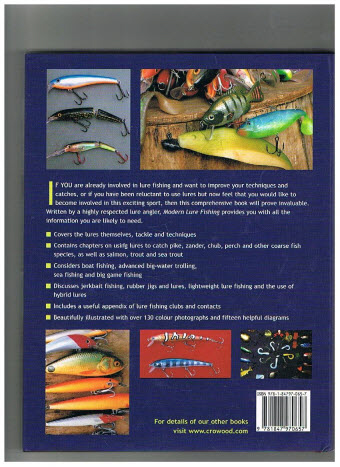 If you are already involved in lure fishing and want to improve your techniques and catches, or if you have been reluctant to use lures but now feel that you would like to become involved in this exciting sport, then this comprehensive book will prove invaluable. Written by a highly respected lure angler, Modern Lure Fishing provides you with all the information you are likely to need. 4to. Pp192. Colour photographs, b/w illustrations by Rebecca Lyne. Foreword by John Wilson. Black boards. Mint in dust-wrapper. This book "provides you with all the information you are likely to need. Covers the lures themselves, tackle and techniques. 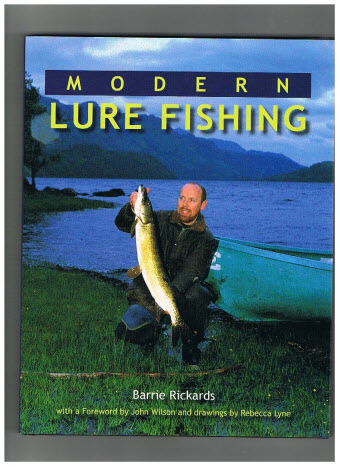 Contains chapters on using lures to catch pike, zander, chub, perch and other coarse fish species, as well as salmon, trout and sea trout. Considers boat fishing, advanced big-water trolling, sea fishing and big game fishing. Discusses jerkbait fishing, rubber jigs and lures, lightweight lure fishing the use of hybrid lures". Contributions by James Holgate and Gord Burton on lure-fishing for pike in large waters, Dave Steuart on spinning for salmon, particularly in South Country rivers, Fred J.Taylor on spinning for trout, and David Bird on lure fishing for big-game species. Very strong on pike fishing but with good sections on light-tackle spinning for other species, and with much on Barrie's fishing adventures abroad, especially on Lake Nasser and in Australia and South America.